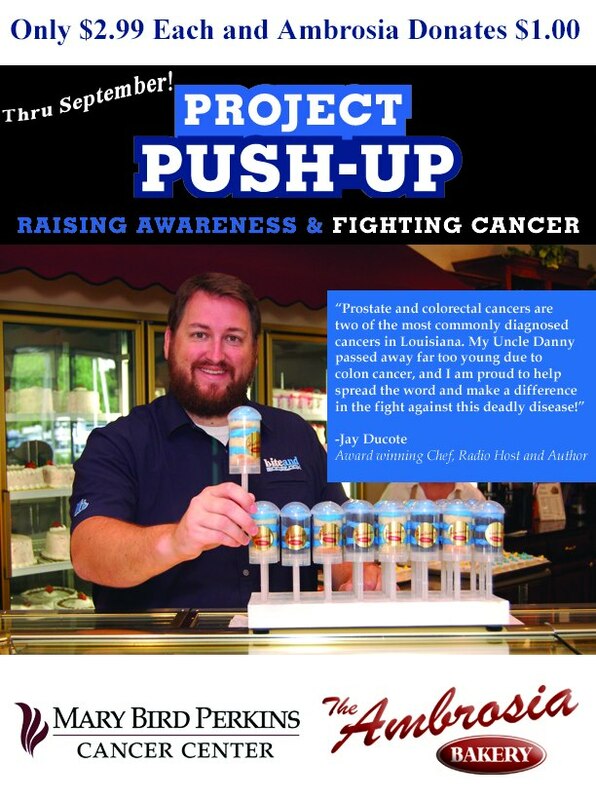 This September I've teamed up with the Mary Bird Perkins Cancer Center for Project Push-Up. The program is designed to raise awareness for prostate and colorectal cancers as well as help fight the deadly disease. The Ambrosia Bakery in Baton Rouge is also doing their part with the "Push-Up Cake Pop." These delicious treats, made in house at Ambrosia's bakery, can be purchased in store or online and sent anywhere in the country. They come with either white or chocolate cake and blue icing for the awareness campaign. $1 for each cake pop sold will go directly to Mary Bird Perkins and their efforts. Please help with this truly worthy cause. Swing by The Ambrosia Bakery on Siegen Lane or visit www.ambrosiabakery.com to place an online order!